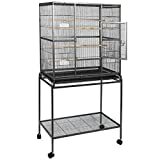 Costway Bird Parrot Cage Large W/Stand Chinchilla Cockatiel Conure Overall 32"x18"x64"
Obviously one most important pieces of equipment for your cockatiel is a cockatiel cage. Whilst there's cheap ones, expensive ones, big ones and small ones, there's a few things to think about when making a purchase. 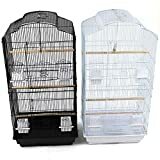 Here is our buying guide to cockatiel cages. It's vitally important that your cockatiel cage is big enough for your cockatiel. This helps to ensure that he or she isn't cramped and can live happily and healthy with plenty of room. A cage that is too small is bound to lead to an unhappy and unhealthy cockatiel - it's just cruel. 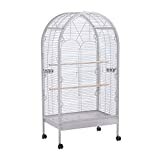 Your cockatiel cage should be big enough for it to spread it's wings comfortably without touching the sides. Anything smaller will likely damage their wings when they stretch. Remember that your cockatiel will spend many hours inside their cage so they have to be comfortable. TIP: As a guide, try and buy a cockatiel cage as wide as double the bird's wingspan if you are only housing one cockatiel. The bars on the cage should not be spaced any further than about 1/2 an inch apart. You don't want a flapping escapee do you?! 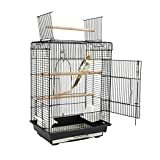 Try and buy a cockatiel cage with horizontal bars as well as vertical ones. Most do in fact. This allows them to hop around at their leisure more easily. 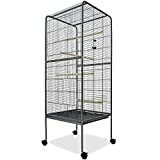 As cockatiel cages can be quite large, especially those on a stand, you'll need enough room in your house to keep it. It's an idea to measure the area where you are planning to put the cage and ensure a cage big enough will fit there. Remember that you will need enough vertical space too if it's tall or on a stand. Always bear in mind that you will need easy access to it so you can easily clean it out and change food and water. It's obviously of utmost importance that the cage that you buy is of good quality. If you have a particular one in mind, try and find some reviews for it online. If you are inspecting one in a shop, read it's details and features, or ask a member of staff. Make sure it's rigid and well built. Give it the once over and ensure that the metal frame is clean, free from loose particles or sharp corners. You don't have to spend a fortune on a cockatiel cage, but generally you will get what you pay for. 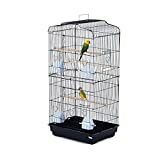 If you are looking for a cheap cockatiel cage then you could always try and find second hand ones in the local newspaper or shop window. Obviously it's still important to make sure it's the right size and quality. Buying a cockatiel cage shouldn't be hard but you should always ensure it's a suitable size and it's not poor quality. This should go a long way to a happy and healthy cockatiel! For more information, please visit the cockatiel cages page over at CockatielCare.co.uk.